At the Heartland Biogas Project, millions of tons of food waste are collected and converted into usable methane gas. 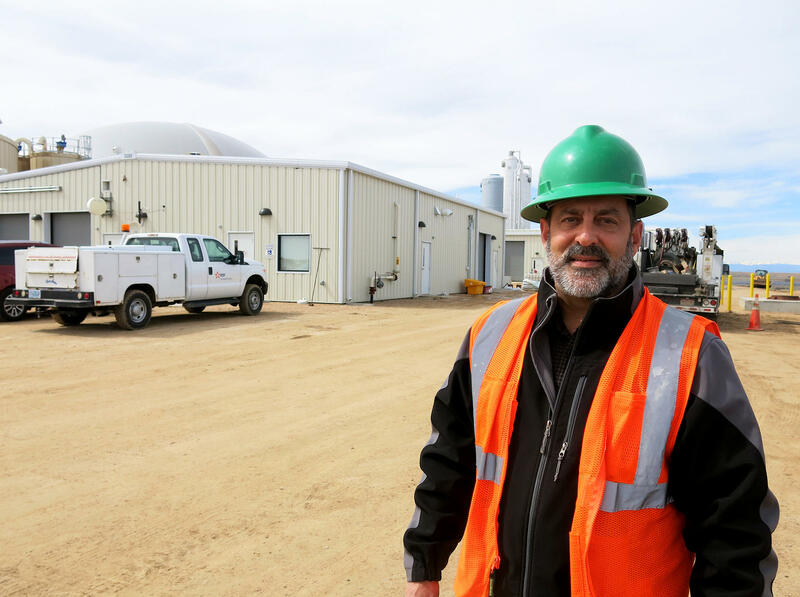 Scott Pexton works for A1 Organics, which runs the food waste processing portion of the Heartland Biogas Project. I went to check out the facility. It's located on a rural road in northern Colorado, situated a stone's throw from big beef cattle feedlots and dairy farms and a short drive from the state's populous, waste-generating urban core. Follow your nose to know you're in the right place. There's no way around it: The place stinks. The odor is a mix of cow poop and expired produce. "Yeah, there's a lot of good smell around here," says Scott Pexton, with A1 Organics, a composting company that runs the food waste portion of the plant. The six huge cream-colored holding tanks at Heartland — which can hold 1.7 million gallons of food waste and manure slurry — work like enormous stomachs. Pretty much anything you could eat can go into the digester. And as with our own digestive systems, what comes out at the end is a liquid (a water-based sludge, technically) — which is captured in lagoons and reused in the digestion process; a solid — used for composting; and a gas. That third thing — methane gas — is what really interests the owners of the Heartland plant. Methane is captured, sent into an interstate pipeline and used to generate electricity. If all the food waste processed at the plant were sent to the dump instead, it would still release methane as it rotted and decomposed — but all that wasted gas would seep directly into the atmosphere and contribute to climate change. Methane is a powerful greenhouse gas. In fact, most of the 130 billion pounds of food that Americans wasted in 2015 sits in landfills, giving off methane. So in that way, anaerobic digesters are able solve a few problems at once. 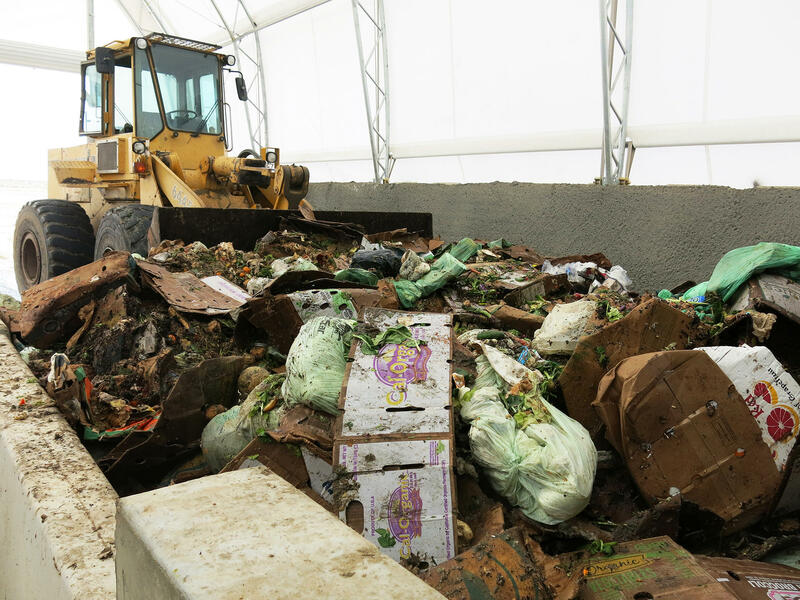 A recent report from the nonprofit group ReFED found that digesters not only generate renewable energy, they also divert food waste from landfills, cut down on harmful emissions and provide a few jobs along the way. "We've seen a lot of those types of digesters in Europe and we're just starting to see them emerge in the U.S.," says Darby Hoover, a resource specialist with the Natural Resources Defense Council, which contributed to the ReFED report. Anaerobic digestion is one promising piece of a much larger puzzle to solve the food waste problem, Hoover says. But digesters are expensive, and many require policy fixes to get off the ground. Cities like Sacramento, Calif., which is working to meet high state standards for renewable energy production, are using biogas generators like Heartland to meet those standards. The Sacramento Municipal Utility District is locked in a 20-year agreement with EDF Renewable Energy — the private development company that runs Heartland — to buy all the gas generated there. But in many ways Sacramento's relationship with Heartland is unusual. More often, Hoover says, cities forgo biogas because they'd have to foot the bill for building and running such facilities by themselves. "With an anaerobic digester you often have a high project cost up front," Hoover says. "Cities may not see that there's a high value to implementing something like a digester." And critics say that while digesters manage the consequences of the food waste problem, they do not address the root of the issue. Consumers throw out a staggering amount of food every year: Knowing there's a machine to clean up their mess could relieve some guilt of throwing food away. So anaerobic digesters are "no silver bullet," says Virginia Till, a recycling expert with the Environmental Protection Agency. She says it's important to focus on "opportunities to focus on reducing waste in the first place." The federal government released the country's first-ever food waste reduction goals in 2015, calling on Americans to cut food waste in half by 2030. Making renewable energy from food that can't be eaten is admirable, Till says. But the best thing to do with wasted food is to feed people. Almost 1 in 7 U.S. households are food insecure, unsure of where their next meal is coming from. "That fact — coupled with the fact that we waste about a third of our food that's produced — those two facts together get me up in the morning," Till says. Heartland's Scott Pexton agrees. "We certainly believe in the idea of reduce first," he says. But even if people stop throwing out perfectly good food, even the most careful, responsible retailers, processors and farmers will generate some waste from time to time. People will still throw away banana peels and corn husks. And for those situations, the big mechanical digesters out on the eastern plains of Colorado will be right there waiting.